Hey Washington Middle School! Thanks for stopping by the library table at lunch time on Friday to talk with Lesley and Shannon about Summer of Learning, your favorite books, and things you never knew about the Douglass-Truth branch. See you at Need to Know every Sunday through Thursday this summer, starting on June 23, 4-5 pm. We’ll be giving away free books, answering questions, doing activities, and hanging out in the teen area at Douglass-Truth library. 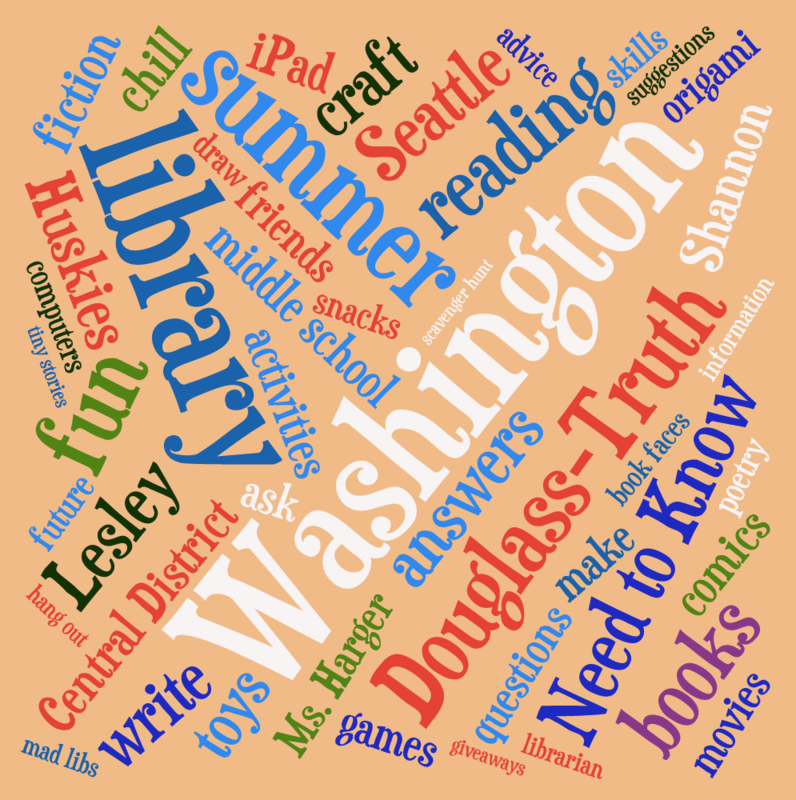 This entry was posted in School News, Summer Reading Program and tagged Douglass-Truth Library, favorite books, library table, school shout out, Summer of Learning, summer reading, washington middle school on June 9, 2014 by Shannon. I went to an after-school meeting, knowing only that it had to do with late start Tuesdays and education. I went in expecting there to be lots of other students there, I thought this would be a huge group of students protesting the apparent end to late start Tuesdays. It wasn’t. After tracking down the friends who had invited me, we went to the classroom this “meeting” was said to take place. Given my previous conceptions of what this meeting would have in store, you can imagine my surprise and confusion when upon entering I was not greeted by the sight of other class members but instead, three history teachers whom I knew by reputation only (we were later joined by two Language Arts teachers whom I also didn’t know). I also quickly caught on that this meeting was not just about the proposed cancellation of late start Tuesdays. This meeting was about re-thinking the education system. This entry was posted in Community, OMG Controversy!, Opinions, School News, Teen Powered and tagged abstract thinking, education, educational theory, essays, high school, Nathan Hale HS, Seattle, written by teens on June 9, 2014 by Teen Blogger.